Are you a die-hard fan of Rachael Ray and can’t get enough of her delicious recipes? Well, now your furry friend can enjoy delicious treats inspired by the talented TV host and renowned cook. Dedicated dog owners realize the importance of selecting the right dog food brand that is why selecting the right option can prove difficult. Unfortunately, most commercial dog food brands in the market use filler content and empty calories to deceive customers. This is one of the reasons why Rachael Ray has created her own brand of high quality dog food. 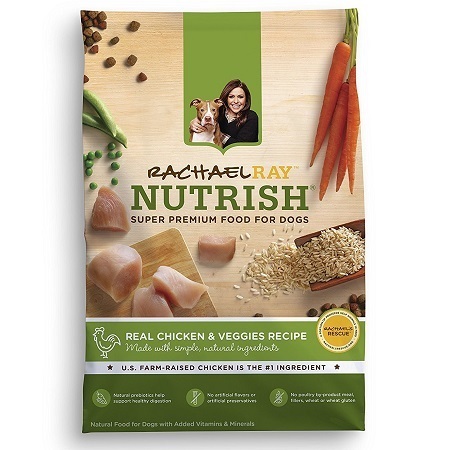 Rachael Ray Nutrish Natural Dry Dog Food includes high quality ingredients, such as chicken, seafood and veggies, which make for a delicious yet nutritious treat for their dog. 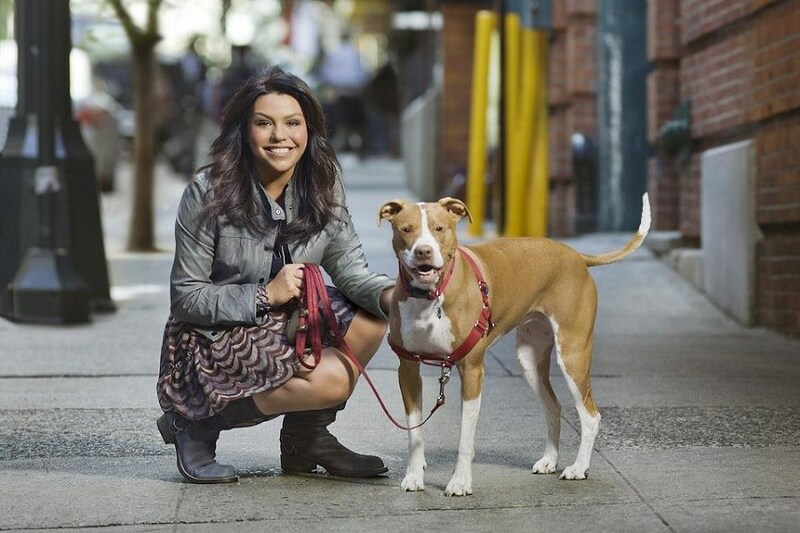 A happy pet owner, you will be pleased to know that a portion of Nutrish’s proceeds go to Rachael Ray’s Foundation. High Quality Ingredients - The recipe incorporates easily digestible carbohydrates that will keep your furry pal’s gastrointestinal health in check. Rest assured, all the ingredients are carefully inspected before they are added to the formula. The brand selects high-quality ingredients, such as beef, chicken and seafood, and combines it with wholesome veggies to increase its nutrient value. Real Recipes - The brand understands the importance of feeding your dog high quality nutrition that also tastes great. Rachael Ray is a renowned cook that loves food and pets which is why she has come up with delicious recipes that your dog won’t be able to resist. All Natural Ingredients - Health conscious dog owners will be pleased to know that Rachael Ray Nutrish Natural Dry Dog Food does not contain colors, artificial flavors and preservatives. 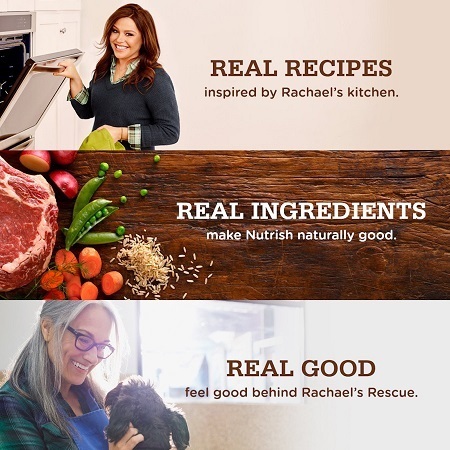 Three Exciting Flavors - Rachael Ray Nutrish Natural Dry Dog Food comes in three exciting flavors, including Real Chicken and Veggies, Real Beef and Brown Rice, and Turkey Brown Rice and Venison. Are you conscious about your diet and only use natural ingredients? Well then it only makes sense if you follow the same standards for your pet. Rachael Ray Nutrish Natural Dry Dog Foodonly utilizes the best ingredients in the market that will provide your dog wholesome nutrition. Carrots - Carrots serves as an excellence source of vitamins, minerals and carotenoids. These nutrients play an active role in boosting your dog’s digestive health and immune system. Brown Rice - Brown rice serves as an excellent source of wholesome fiver and essential B vitamins. This keeps your dog’s digestive system in check. Real Chicken - When it comes to feeding your dog a nutritious diet, one cannot undermine the importance of protein. 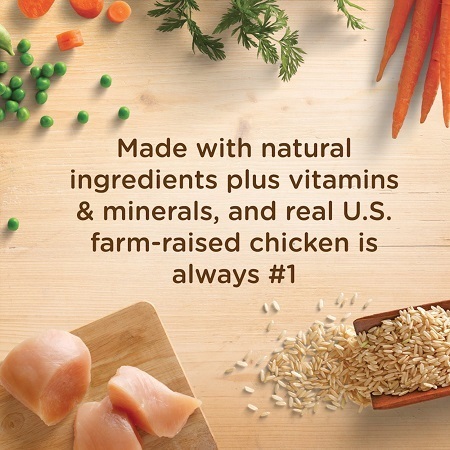 Rachael Ray Nutrish Natural Dry Dog Food includes real chicken that supports healthy organ function and improves muscle mass. Rachael Ray Nutrish Natural Dry Dog Food received an average rating of 4.4 stars out of 5 on Amazon at the time of this review. Most customers were highly satisfied with the product and had left positive reviews while other customers agreed the product could use some improvements. Many customers wrote they were incredibly satisfied with the product and that their pets enjoyed it too. A customer wrote the product reduced shedding and drastically improved their dog’s fur coat. A pet owner wrote you would notice positive results after just a few days of use. The product is beneficial and for kinds of dog breeds and does not contain harmful by-products that you would find in other commercial dog food brands. On the downside, a few customers were not happy with the product and claimed it caused their pets to become ill. We advise you gradually include a new dog food in your pet’s diet instead of changing it abruptly. A customer wrote they were not happy with the product and claimed it was low quality. The customer also accused the brand of using artificial dyes, gluten and other ingredients that you would not want to find in dog food brand. A customer wrote the product is over-priced and is not worth the hefty price. Consider opting for other Nutrish products if this one does not cater to your needs. Rachael Ray Nutrish Natural Dry Dog Food can be purchased on Amazon for just under $30 with free shipping on Amazon Prime. To save money, consider looking out for promotional offers, deals and discounts. Customers can visit Rachael Ray’s Nutrish official website if they want to learn more about the product or browse through other kinds of dog food. Rachael Ray Nutrish also offers a variety of grain-free products that protects your dog against the harmful effects of gluten. Customers can also choose from an extensive variety of dry and wet dog food for their pets. Since the product is available in a variety of sizes, you can test it first and then purchase a larger pack for your dog. Overall, Rachael Ray Nutrish Natural Dry Dog Food is a high quality dog food that is suitable for all kinds of dogs. However, the product might not be suitable for your dog if you want to increase their water intake. Consider checking out other products if this dog food does not suit your needs. If you are on a limited budget and have multiple pets, we suggest you invest in another food brand as Rachael Ray Nutrish Natural Dry Dog Food may be a little heavy on your pockets in the long run. 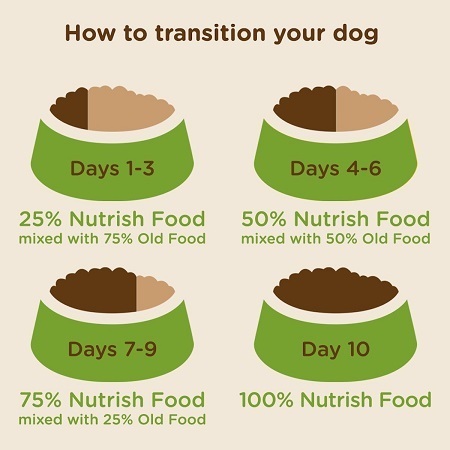 We recommend that you gradually increase the dog food in your pet’s diet to reduce the risk of adverse reactions.